Buy the Limited Edition Samsung Galaxy Note9 512GB in Ocean Blue and get a FREE 46mm silver Galaxy Watch. Perfect for the driven gentleman who loves to maximize productivity, the 512GB variant allows users to carry, manage, and work on multiple files on-the-go with ease. This limited-edition model also supports expandable memory of up to 512GB, enabling users to carry up to 1TB of storage. Pair the Galaxy Note9 with the Galaxy Watch that keeps users connected and on track all day. Handle daily tasks with ease and power through busy schedules like a pro! Samsung is also offering a Limited Edition Galaxy Note9 128GB in Frosted Lavender. This chic variant fits the fashionable woman who lives a stylish and dynamic lifestyle. Each purchase of the Frosted Lavender Galaxy Note9 during the promo period will come with 50% discount on select Samsung wearables, including the 42mm rose gold Samsung Galaxy Watch. Ladies can also keep their busy schedules on track while keeping their looks on point with the smartwatch’s customizable faces and straps. 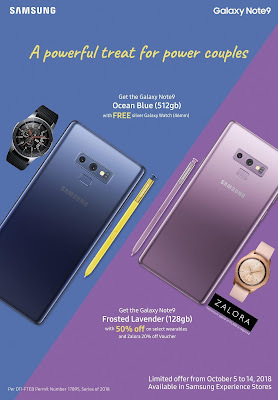 To further upgrade their style game, new owners of the Galaxy Note9 Frosted Lavender model will be eligible for discounts on Zalora via the Samsung Members App. Users can redeem a promo coupon to enjoy 20% off on a minimum purchase of Php1,500. They can also get a FREE L’Oreal Paris Color Riche Matte lipstick worth PHP 350 within the promo period. Simply redeem the L’Oreal promo card on Samsung Members to get a voucher code. 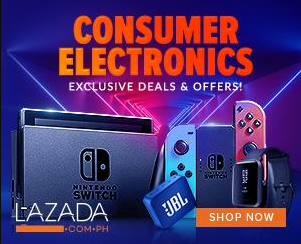 Choose a lipstick variant on Lazada and input the promo code to avail of the freebie. Both offers can be redeemed from October 5 to December 31, 2018.